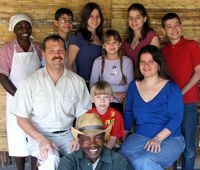 Thomas and Amy Morrow, founders of Kazembe Orphanage, started out in the capital of the country, Lusaka, working with community schools for underprivileged children. Their program included education, teacher training, medical checkups, as well as food and clothing distribution for the disadvantaged and local orphanages. 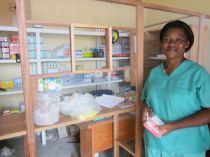 After successfully assisting a community school in a low-income neighborhood in Lusaka, they moved to northern Zambia, in response to the need for orphan care. 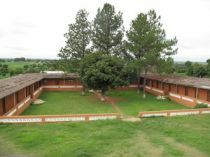 In 2006 an orphanage was built in Kazembe, a village in northern Zambia in cooperation with the local social welfare department. They bought and renovated an abandoned motel property —rebuilding the existing structures and adding septic tanks, borehole & water pump, electric lines and several new buildings. Also included is a small medical clinic to care for the orphans, many of which come to them malnourished and in very poor physical condition. 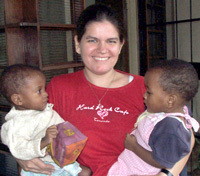 Kazembe Orphanage opened its doors in 2007 taking in 5 children in the first 2 months. 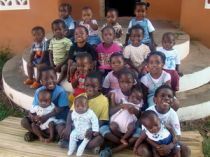 The orphanage now has grown to include 23 babies, preschoolers, and kindergarteners, and employs 16 people both fulltime and part time. Now that the children are older, school lessons are given every day to teaching reading, writing, arithmetic as well as general Science and Social Studies. A Physical Education teacher also comes three times a week. Plans are in place to build a school building so that proper classrooms can be utilized. With the children growing up, construction of a boys’ cottage has begun. It will hold 8 older boys and a staff member. It will also have a sitting room/classroom. In the summer of 2012, the children’s bathroom was renovated and tiles placed on the walls and floors to allow for better cleanliness. A 350 L solar water heater was also donated and volunteers helped to construct the tower which holds it. Now the children and live-in staff members will have hot water for bathing.